Let’s take a break from all the Thanksgiving dishes and make a super easy, super comforting vegan cream of potato soup, ok? I love a holiday centered around eating just as much as the next person, but I just really wanted to make a soup to step away from all the casseroles taking over at the moment. Even though I love to cook and love to cook for other people even more, a big holiday can have so much pressure and hard deadlines around it, that the fun in cooking seems to disappear. Sharing a big pot of potato soup and passing around a loaf of crusty bread sounds just as fulfilling as taking part in an elaborate meal, it’s all relative. For this round of vegan cream of potato soup, I used some leftover mashed potatoes that were going to turn into a baked casserole mashed potato dish, but it didn’t end up panning out and soup sounded a lot more appealing to me at the moment. First of all, if you have leftover mashed potatoes, you are either not eating enough mashed potatoes or made any overabundance of them, for which I applaud you. If you happen to get sick of eating them straight up with a spoon or doused in gravy (I mean, who are you? ), then I have a perfect solution for making a super fast and easy soup that just seems fancier with the addition of crispy sage. The sage is optional, but chopping up a good handful of herbs and quickly pan frying them makes a perfect garnish and addition to this creamy soup. If you already have mashed potatoes on hand, this soups can come together in a matter of a few minutes. Otherwise, the extra steps of boiling and mashing a few potatoes doesn’t add too much time to the prep, especially if you happen to do it ahead of time. A word of warning, make sure you chop the sage nice and finely before frying up. I made the mistake of leaving a few very large pieces and when I bit into them in the soup there was an explosion of sage flavor (which is ok if you like that! ), which is a little too much for me. Dice finely and you should be fine! 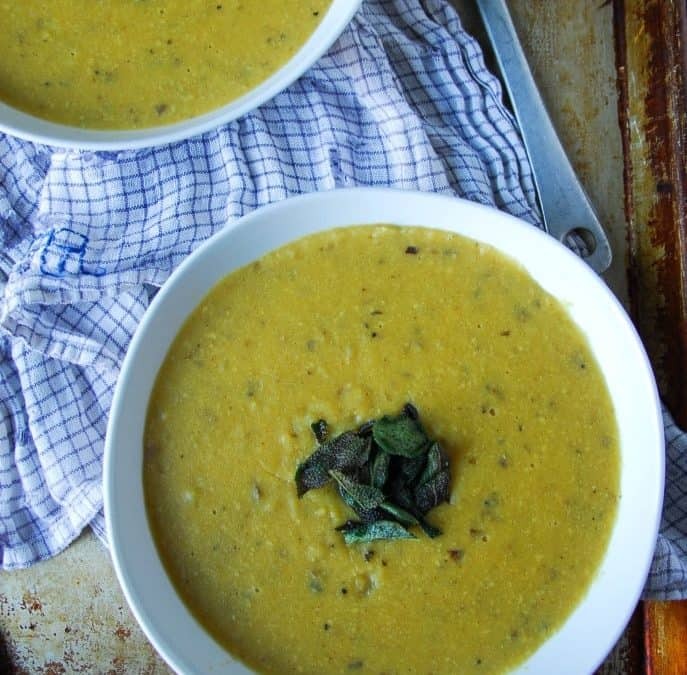 Leftover mashed potatoes make this soup easy and creamy! In a large pot over medium-high heat, bring all ingredients, except for 2 tablespoons of the sage, to a boil while whisking constantly. Keep whisking ingredients together until smooth and creamy, for about 7-10 minutes, adding more or less liquid as needed, according to taste. After soup has come together and is heated throughout, fry the remaining 2 tablespoons of sage in a few tablespoons of coconut oil over medium-high heat, until crispy and browning on the edges, about 3-4 minutes. 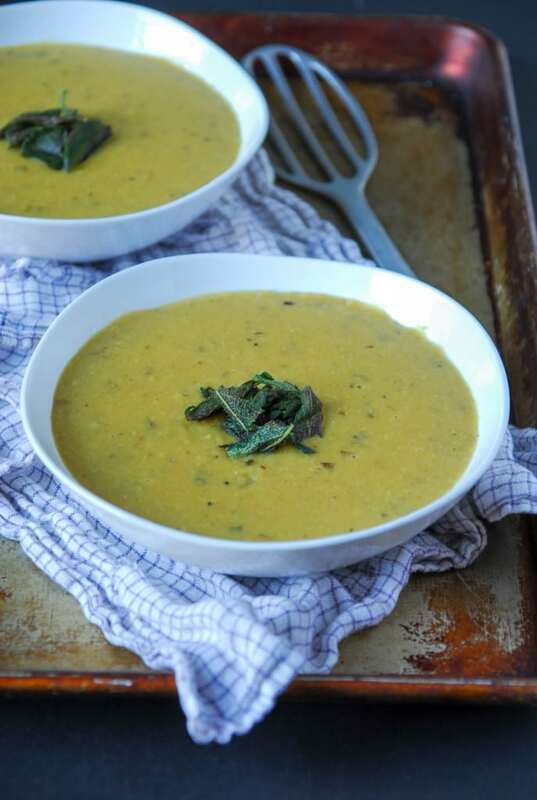 Serve soup in bowls, sprinkled with crispy sage. I love your tasty thicker soup, Abby! Yummm! Who doesn’t love fried sage? 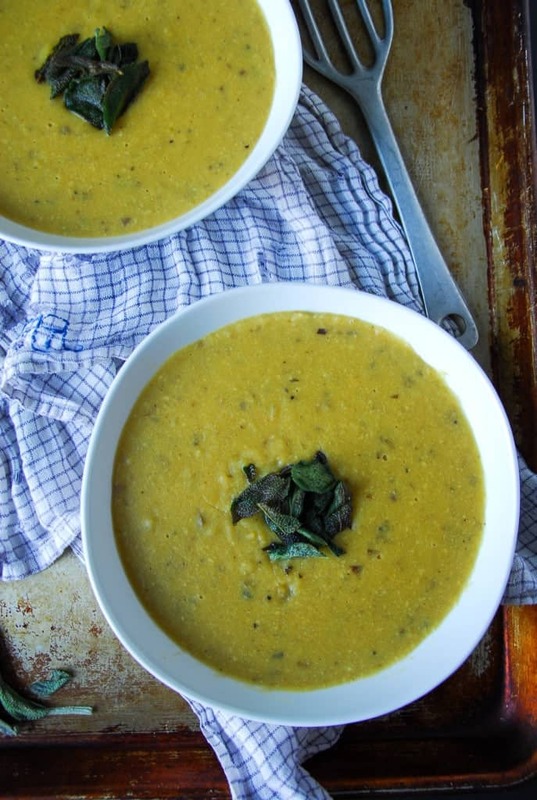 Ah heck yes, I’m going to hoard the mashed potatoes at my Thanksgiving feast so that I can turn them into this soup!! It looks so warm and comforting, indeed! 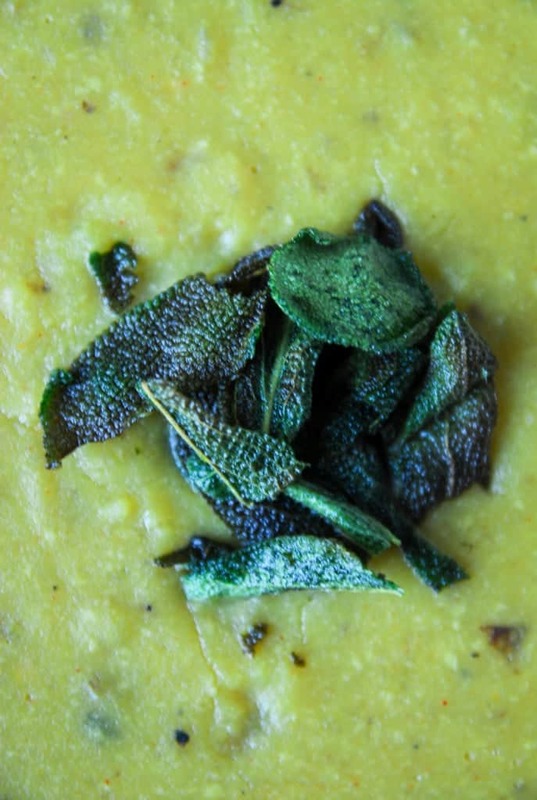 And I’ve never made crispy sage – I MUST do this, I MUST! I love this soup! And I love fresh sage! Look at that sage. I never knew “crispy sage” would be a turn on for me, but ooh la la. These look tasty. I know, right?! LOVE anything crispy! I love the smell of sage this time of year and it’s even better fried. Now I’m kind of hoping our Thanksgiving guests don’t like mashed potatoes so I’ll have leftovers to make this soup. Me too, it’s my favorite!